Gilbert F. White was the Gustavson Distinguished Professor Emeritus of Geography at the University of Colorado from 1980 until his death in 2006. Prior to that, from 1970 to 1978, he was Professor of Geography and the Director of the Institute of Behavioral Science at the university. He was also the founder and Director of the university's Natural Hazards Research and Applications Information Center (now called simply the "Natural Hazards Center") from 1976 to 1984 and again from 1992 to 1994. Gilbert Fowler White was born November 26, 1911 in Hyde Park, Illinois. (In 2005 he celebrated his 94th birthday, in Boulder Colorado.) As a boy he spent his summers at his father's ranch in northern Wyoming, an experience he often cited as one of the origins of his interest in geography. He received his undergraduate and graduate degrees from the University of Chicago, and his doctoral dissertation, Human Adjustment to Floods, has been called the most influential ever written by an American geographer. "Floods are 'acts of God,'" he wrote, "but flood losses are largely acts of man." Gilbert subsequently served from 1934 to 1940 in the New Deal administration of Franklin D. Roosevelt as the secretary to the Mississippi Valley Committee, National Resources Committee, and National Resources Planning Board. From 1940 to 1942 he worked in the Bureau of the Budget, Executive Office of the President. In 1942 as a conscientious objector to military service, Gilbert joined the American Friends Service Committee, aiding refugees in France. He was interned in Baden-Baden, Germany until 1944 when he was allowed to return to the U.S. He continued working with the AFSC until 1946. On April 28, 1944, Gilbert married Anne Underwood. Together they not only established a home and raised a family (they had three children — Will, Mary, and Frances), they also conducted landmark research on domestic water use in Africa. They remained colleagues and closest companions until Anne's death in 1989. In 1946 Gilbert White was named President of Haverford College (the youngest college president in the United States at the time), where he served until 1955 when he returned to the University of Chicago to become Chair of the Department of Geography. While at Chicago, he spent one year (1962-1963) as a visiting professor at the University of Oxford. In 1969, he left Chicago for the University of Colorado. A devout Quaker, Gilbert helped establish and chaired various Quaker Conferences for Diplomats from 1952 to 1997. He was Chair of the American Friends Service Committee, 1963-1969. In the early 1970s, Gilbert was one of the principal investigators in a major National Science Foundation-funded assessment of the status of natural hazards research in the United States. Subsequently, he established the Natural Hazards Research and Applications Information Center at the University of Colorado. Throughout his career, Gilbert championed the sound, comprehensive management of floodplains and the adoption of a broad range of adjustments to floods. He advocated, where feasible, adaptation to or accommodation of flood hazards rather than the "structural" solutions (dams and levees, for example) that dominated policy in the early 20th century. In 1994, Gilbert created the Boulder Creek Flood Notebook, an on-line plan for studying the next great flood to strike Boulder, Colorado — both the effects of such a catastrophe and the decisions that made it possible. He also contributed funds to support that research when the flood occurs. Besides being known as the "father of floodplain management," Gilbert made major contributions to the study of water systems in developing countries, the management and preservation of arid lands, global environmental change, international cooperation regarding water resources in such areas as the Mekong Delta and the Middle East, nuclear winter, geography education, the management of nuclear waste, and the mitigation of a wide range of natural hazards. A list of his many publications is posted on this website. In the broadest sense, Gilbert promoted understanding, respect, and protection of the natural order, which includes inevitable extremes. In a word, he championed stewardship — preserving nature and promoting sustainable use and husbandry of the natural resources of the earth. Among many other responsibilities Gilbert served as President of the Association of American Geographers, 1961-1962; Chair, Bureau of the Budget Task Force on Federal Flood Policy, 1965-1966; Chair, Committee on Water, National Research Council, 1964-1968; Chair, Commission on Man and Environment, International Geographical Union, 1969-1976; Member, Scientific Committee on Problems of the Environment, International Council of Scientific Unions, 1970- (President, 1976-1982); Chair, Environmental Studies Board, National Research Council, 1975-1977; Chair, Commission on Natural Resources, National Research Council, 1977-1980; Trustee, Resources for the Future, 1967-79 (Chair, 1974-1979); Member, Board on Natural Disasters, National Research Council, 1994-1997; Chair, Advisory Panel on Reducing Earthquake Losses, Office of Technology Assessment, 1994; and Chair, Committee on Sustainable Water Supplies for the Middle East, National Research Council, 1996-1999. A complete list of Gilbert's many endeavors is included in his CV, which is available from this website. Gilbert White was a member of the National Academy of Sciences, the American Academy of Arts and Sciences, and the Russian Academy of Sciences. In 2000, he was presented the National Medal of Science by President William Clinton. 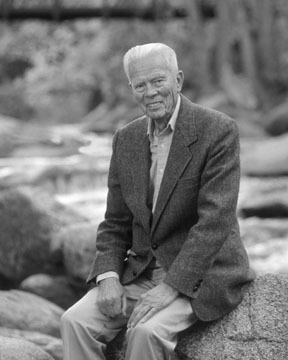 A list of the numerous other honors bestowed on Gilbert White, a catalog of selected publications, and a chronological list of all publications are also included on this website. In the summer of 2003, Gilbert married his longtime friend, Claire Sheridan. They lived in Taos, New Mexico and Boulder, Colorado, where Gilbert remained active in community, national, and international affairs until shortly before his death.